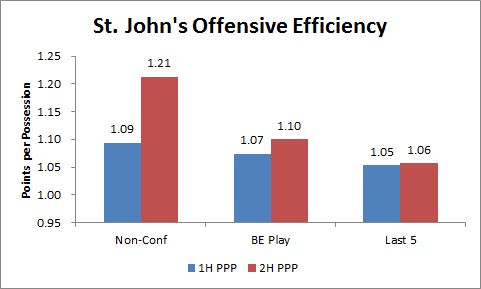 Prior to Big East play, St. John’s posted a whopping 1.21 points per possession (PPP) in the second half, a full 0.12 PPP more than it had in the first 20 minutes of its games. But when comparing the non-conference to the last five games, first half PPP declined by 0.04 points while second half production declined by 0.15 points. And while it is true that the Red Storm’s non-conference slate was significantly weaker than the quality of its conference foes, we would expect their first half numbers to show a similar decline. In other words, this team’s offense has become decidedly average at just 1.05 PPP and it doesn’t help that its defense has yet to turn a meaningful corner. Maybe the last few games are just a blip and St. John’s will return to form over the next few weeks — or maybe the early season second half results were just a statistical aberration. But if it was the latter, then the team’s ascension to Top 25 status was just a case of being overrated. Regardless, the alarming truth is that St. John’s simply doesn’t have enough depth needed to succeed over the course of a full season. Four players are logging over 30 minutes per game and the team ranks 348th nationally in bench minutes, meaning there are only five teams in the country that play their starters more often than the Red Storm. Whether under-prepared or inexperienced, the imperative still exists: Chris Mullin needs to find ways to play his bench. This entry was posted on Wednesday, January 30th, 2019 at 1:18 pm by Justin Kundrat	and is filed under big east, feature, microsites. Tagged: st johns, st johns bench. You can follow any responses to this entry through the RSS 2.0 feed. You can leave a response, or trackback from your own site.